Welcome to Alpha TransForm! In this 3 part tutorial, we'll walk you through the process of creating, filling, and submitting your first form in Alpha TransForm. NOTE: You may want to watch this tutorial as a video before doing it yourself. Watch it here. If you have two monitors, we recommend you keep this tutorial open on one monitor while you do the tutorial on the other monitor. If you have one monitor, open this tutorial in another tab. 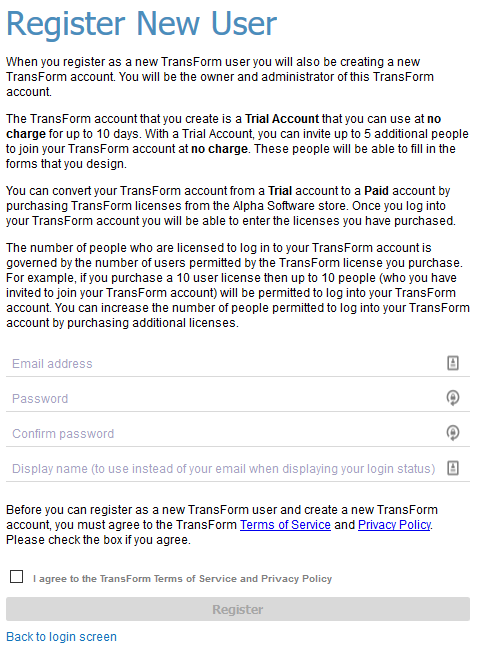 After you create your account, you will be logged into TransForm Central. If you already have an account or want to return later, go to transform.alphasoftware.com to log in and return to TransForm Central. In Alpha TransForm, a "form type" is the term for a form design. Let's begin by creating a new blank form type. Click on the Designer tab. Because you do not have any form types yet, a dialog box appears asking what you would like to do. Click Add Blank to close the message and create a new form type. Alpha TransForm will create a new Form Type with a Display Name of New Form1 . 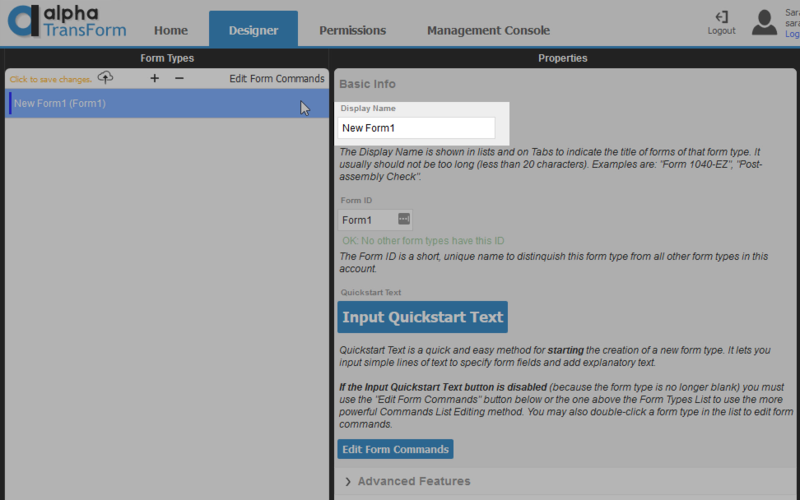 The Display Name is the name that will be displayed in TransForm Central Designer and Management Console tabs. The Display Name is also shown in the Alpha TransForm mobile app. Type Equipment Inspection in the Display Name text box. This gives the form a meaningful name. Click the Input Quickstart Text button. 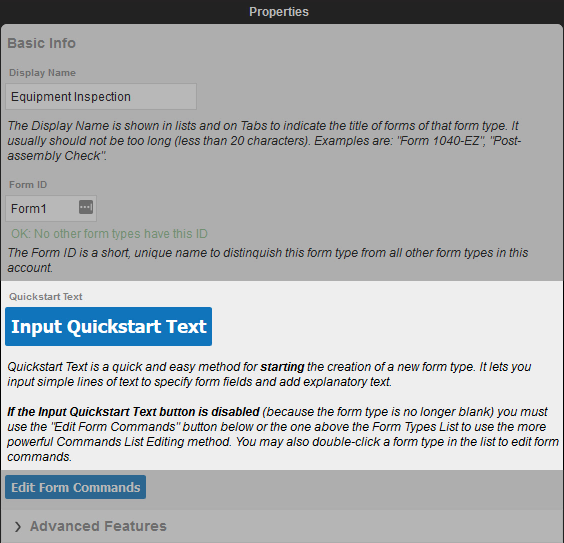 This will open the Quickstart Editor, which we will use to design our first form type. Place your cursor on the same line as the "Type of Equipment" field. 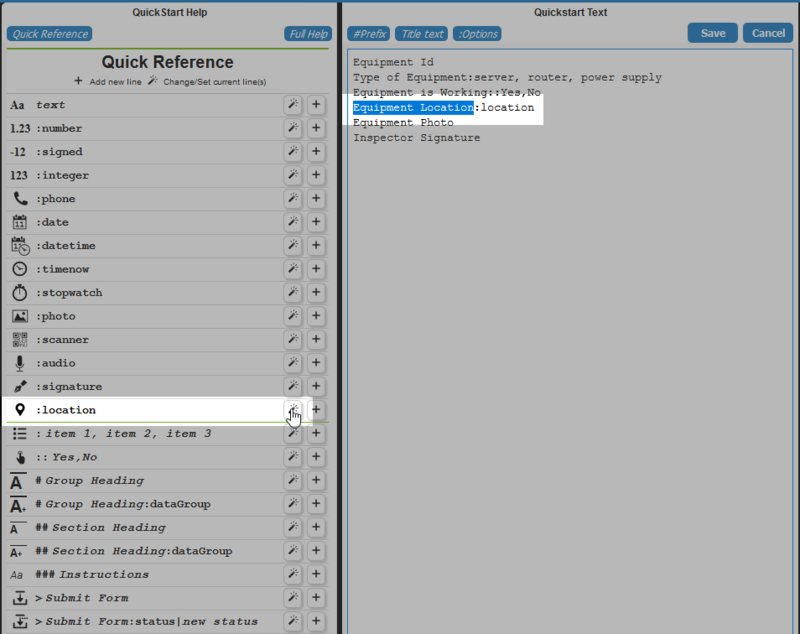 for the :item 1, item 2, item 3 option in the Quick Reference to change the Type of Equipment field to a list of choices. By default, three choices are assigned: Small, Medium, and Large. Place your cursor on the same line as the "Equipment is Working" field. 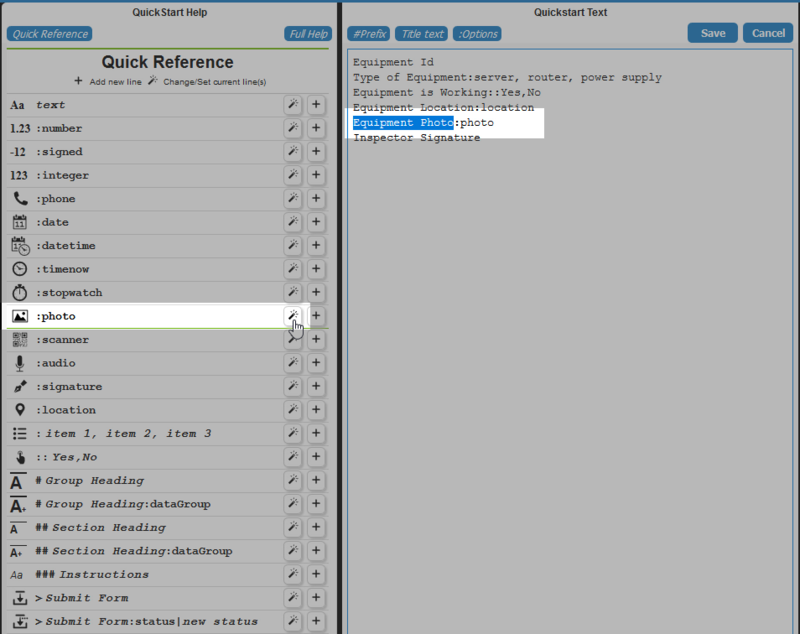 for the :: Yes,No option in the Quick Reference to change the Equipment is Working field to a button list. By default, the button list has two options: Yes and No. Place your cursor on the same line as the "Equipment Location" field. for the :location option in the Quick Reference. This will set the field type for the Equipment Location field to a location field. A location field is a special field that captures the user's current location and renders it as a map in the form. Place your cursor on the same line as the "Equipment Photo" field. for the :photo option in the Quick Reference. 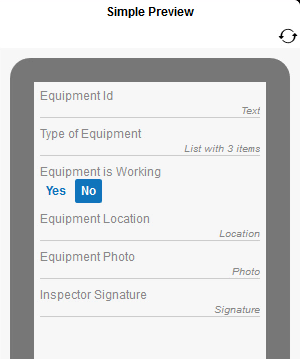 This will set the field type for the Equipment Photo field to a photo field. A photo field is a special field used to capture images on the user's device. It opens the user's camera and lets them take a photo, which is then saved and displayed in the form. 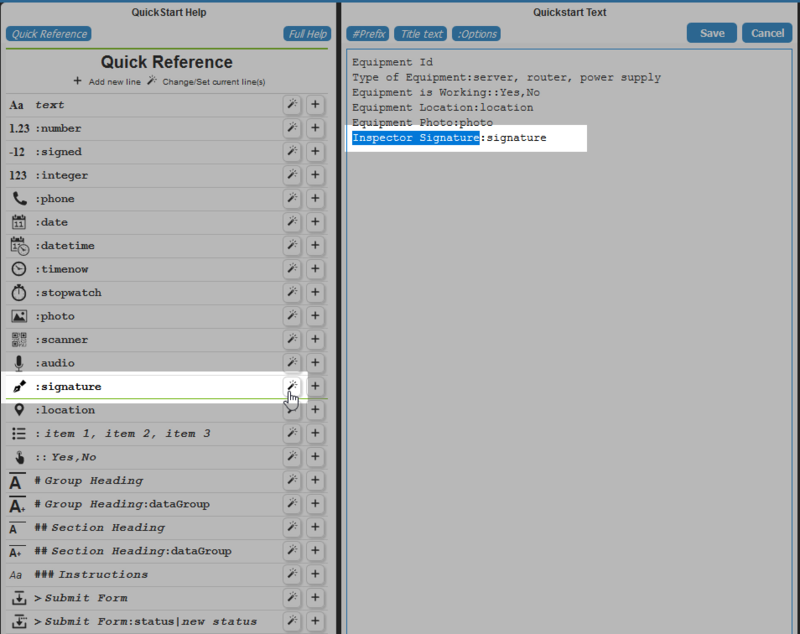 Place your cursor on the same line as the "Inspector Signature" field. for the :signature option in the Quick Reference. This will set the field type for the Inspector signature field to a signature field. A signature field presents the user with a signature editor that they sign with their finger or stylus. In addition to capturing the user's signature, it also capture the date and time the signature was captured. Review the fields in the Simple Preview window to verify that the field types for each field match the image below. You should have 6 fields: a text field, a list with 3 items, a field with two buttons, a location field, a photo field, and a signature field. If the fields do not match, make the appropriate changes. Click the Save link to save the Equipment Inspection form and return to the list of forms. Important: Once you save, you will no longer be able to edit these fields using the Quickstart method. Instead, you can edit these fields by clicking the Edit Form Commands link (Form Type column) or button (Properties column) on the Designer tab. Click Click to save changes to save the new form to the TransForm cloud so that it can be accessed on a mobile device running the Alpha TransForm app. 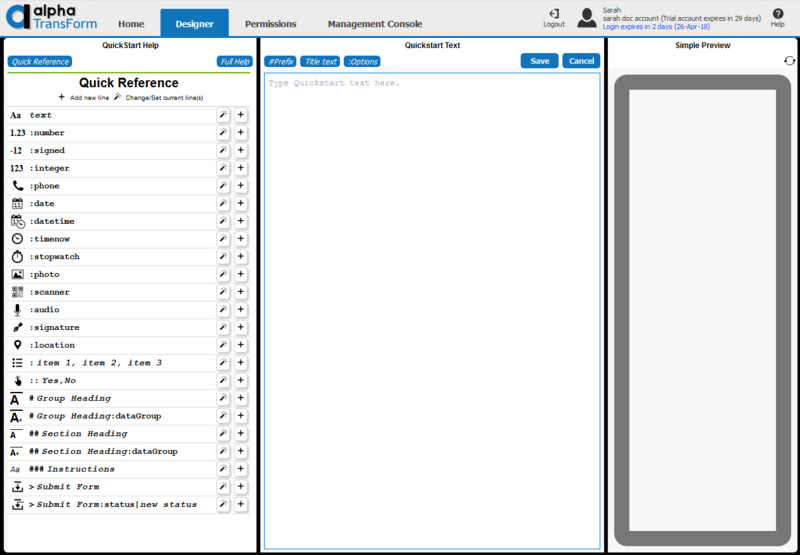 Forms can also be created using a template. To learn how this is done, see Creating a new Form Type from a Template. Now that you have created and uploaded a Form Type, let's go try it out in TransForm Tutorial Part 2: Using the Alpha TransForm App.